I really wanted to help Amber directly, but also saw that other people on her thread were having the same struggle. So I volunteered to do a recorded session with her on Zoom, which then we could share with other people. She was game to do it, so last week, we spent an hour digging into her story, and seeing what threads emerged. I told her we were first going to examine her internal story, which in the Body of Work context is the first story we have to get straight — because if we don’t deeply understand and believe how the different parts of our body of work fit together, how can we explain them to someone else? I am always a mixture of excited and scared at such an endeavor, because the connections don’t always jump out immediately. That is honestly one of the best and most creative parts of this work. Listen in to hear live how Amber described her work, then how we searched together to find meaning that tied it together for her. It was amazing how clear a feeling emerged for me as I listened to Amber. I felt such a strong spirit of her brand, no matter which part of her work she talked about. To me, that feeling was love — and how lucky her clients, peers, friends, family and doggies are to spend time with her. We also talked about how a word like “love” did not fit her self-described rebel with tattoos and wickedly professional image. 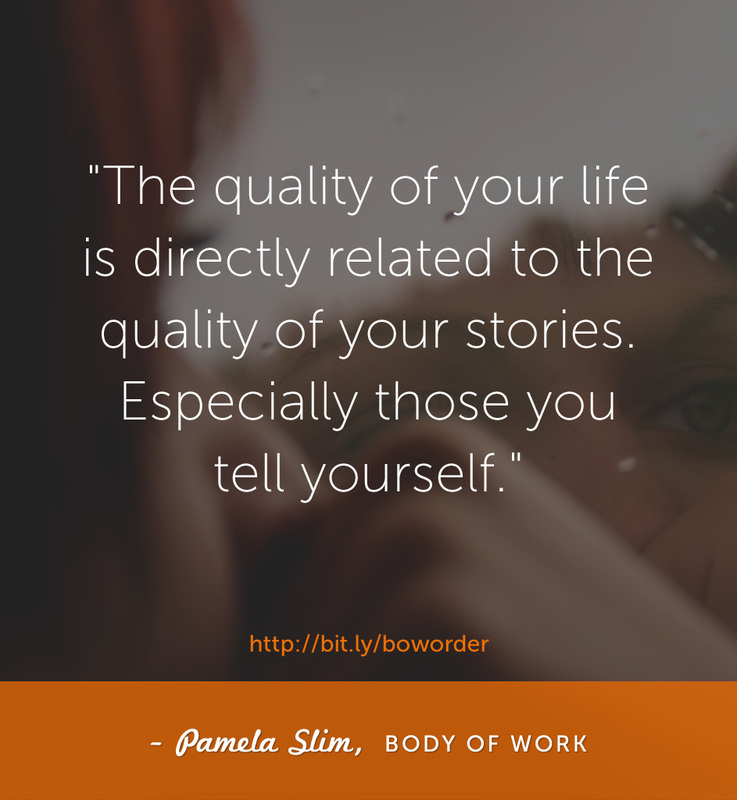 And how sometimes you use words in your internal story that you choose not to use with your external story. That is ok! Understanding the spirit of your brand for your internal story is different than choosing exactly how you want to frame your work for the outside world. We are socialized along rigid binaries: we are an optimist or a pessimist. We are “for” something, or we are “against” it. Amber’s story reveals that there can be an extremely powerful role in bridging between two extremes. We need more people who can help us build context, deal with ambiguity, and manage conflict and anxiety. She shines in this area, and is uniquely qualified to do so. When it comes to working on the next, outward facing story for Amber’s Body of Work, that will involve some more work and word smithing. Rarely do you get the perfect tagline in one conversation. It took me six months of hard work to come up with Escape from Cubicle Nation, with the guidance of Suzanne Falter. I often send people to experts like my amazing clients Tamsen Webster who helps you find your Red Thread, and Kindra Hall for specific, strategic storytelling. Amber: Thank you for being so open and allowing us to peek into your thought process as you find ways to describe your overall career. I walked away an even bigger fan of you and your work. And eager to send people your way. 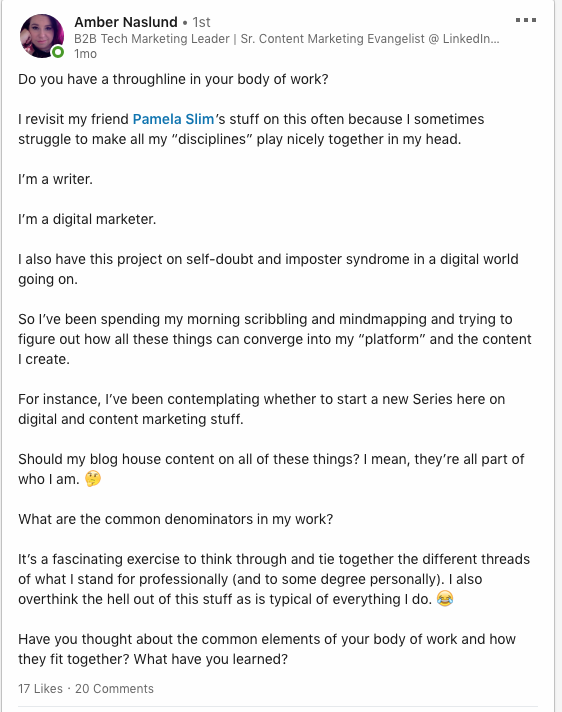 You can learn more about Amber on LinkedIn, where, coincidentally, she also works! Speaking of gifts, YOU shine when it comes to asking precisely the right questions that help uncover answers I didn’t even know were in me. And what struck me about our session is how much emotion and feeling played a role in defining very concrete things. I think like a marketer so I’m all about distilling things into brass tacks, but sometimes a softer and more spirit-centered approach works wonders. What a treasure you are. Thanks for giving so much of yourself to my very personal process, and for your generosity of heart and mind. I’m so eternally grateful to know you.